While this development was not directly related to RDG Filings day-to-day work as a SEC Filings agent that specializes in full-service XBRL filing for corporate and mutual fund filers, we were pleased to see the value and importance of XBRL financial reporting enthusiastically endorsed by Citi and the DTCC. XBRL is the future of financial reporting, and the value of this relatively new tool is contingent upon the quality of the code created. 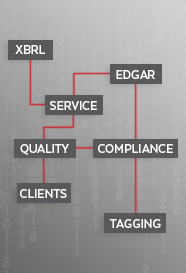 RDG Filings is committed to the present and future of XBRL reporting, and as major part of that commitment, RDG is committed to creating the highest quality XBRL possible.